The year 2017 has seen a renewed interest in, and a re-evaluation of, the music of Georg Philipp Telemann. Centred around the 250th anniversary of the composer’s death on the 25th June, this has led to the release of many excellent new recordings and reissues. This recording, the finest I have heard, arrives late to the celebrations. 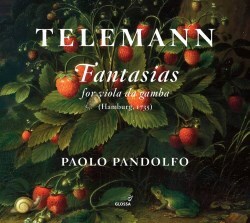 The Fantasias were published as a subscription in Hamburg in 1735 by Telemann’s own publishing house. They were until recently regarded as lost, despite him having subscribers in most of the main musical centres of Europe. It was not until 2015 that a printed copy of the Fantasias was discovered in an archive in Osnabrück and published the following year. This is the third complete recording of the Fantasias since then, and there has been an arrangement for flute. The Fantasias were composed at a time when the viola da gamba was beginning to go out of fashion in mainland Europe, though its popularity survived a little longer in England. That is why Telemann employed devices in his compositional style that utilised every aspect of the instruments, as well as the performer’s abilities. The result was something quite new and imaginative, a set that exploited counterpoint, fugal techniques and pizzicato passages to show the instrument at its best. Ten of the Fantasias are set in three movements, mostly in the fast-slow fast scheme. Only the Fantasias No. 1 and No. 2 stray from the three-movement model. The First has two movements, although the first movement has four distinct sections alternating Adagio-Allegro-Adagio-Allegro. In the Second Fantasia we have four movements; whilst the third movement could be said to be a nod to the past in the way that it is a reintroduction of the first-movement Vivace, what follows is something completely different— a dance in the new Galant style. This is not the only occasion that Telemann would employ this device of looking back as well as forward to the new age in these compositions. For example, in the Fantasia in E No. 10 he once again employs two contrasting passages in the first movement, followed by two beautiful dances. As mentioned above, these Fantasias exploit every aspect of the instrument and therefore require an expert performer. These seem to have been works for no mere amateur, and I am glad to say that in Paolo Pandolfo we have a gambist who is more than up to the task. He exploits every nuance of this music. He navigates the instrument’s full register with no apparent effort, moving between the traditional and modern sections with aplomb, while bringing out all the beauty and panache that Telemann has to offer in this music. I do not know the other recordings, but I assume that they would have to be something exceptional to exceed Pandolfo’s performance. The performance is matched by the production. The recorded sound is excellent, and the clarity enables the listener to experience every aspect of the instrument and the music. The booklet notes, which comprise an introduction by Paolo Pandolfo as well as an assessment of the music by Peter Wollny, are exemplary. This is Glossa ending the year on a very high note.